You want your 50th anniversary invitation to look gorgeous and the best bit is that you get to choose the style and the wording. or a more classic look in gold. Take a look at the designs below to get ideas of what you would like. 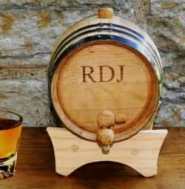 They can all be personalized with your own details and photos. Plus you can order exactly the number you would like rather than having to buy big packs. If you are planning on designing the invitation yourself there are a number of packages for your computer or you can just use a word document. We designed a great invitation by scanning an old wedding photograph and then using an itallic font for all the lettering. 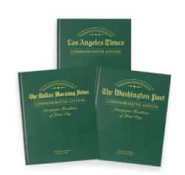 If you print onto good quality paper it will increase the overall look. If you have a big quantity to print then it may be worth taking a copy or emailing a printer with the original and then paying for them to run off the invitations. 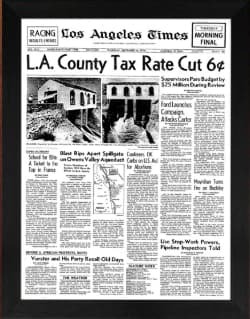 A fun 50th anniversary invitation is to design a frontpage mock up of a newspaper from the year that they were married with the details of the anniversary party. 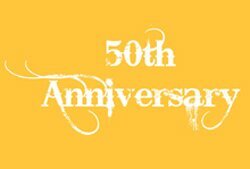 You can also find lots of 50th wedding anniversary clipart online, all the websites offer similiar designs, mainly hearts, flowers and couples. Most offer free use for personal use, so I would find a site that you find easy to use. It is worth thinking about when you are going to send out your invitations, you will probably have a large number of guests that will need to travel and so it is best to send out the invites early. Almost as soon as you have the venue. 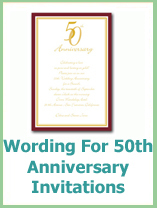 Wording in the invites should state your 50th anniversary couple's names, the date of the party, the venue and the date you need them to reply by. If they are not from the area it would be worth sending directions and a list of possible accommodation. Click on the image on the right for wording samples.